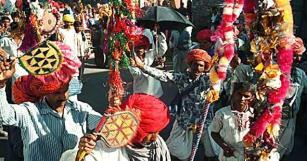 This eight-day fair held every year during the month of January - February, is popularly known as the cattle fair and is the second largest in Rajasthan. Nagaur Town is the most picturesque of Rajput townships. The town becomes a sea of animals, trading over 70,000 bullocks, camels and horses every year. The bullocks are known for their fleetness. Not only are the animals lavishly decorated, even their owners flaunt their colorful turbans and long moustaches. Situated half way between Bikaner and Jodhpur, Nagaur awakens with the thronging of cattle, horses and camels accompanied by their colorfully turbaned owners. There is earnest bargaining between owners and buyers, and plenty of fun and festivity.